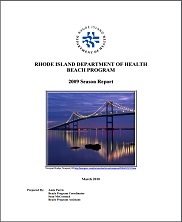 The Rhode Island Department of Health (HEALTH) is responsible for the licensing and regulation of bathing beach facilities in the State of Rhode Island. This includes both fresh and saltwater beaches. Funding for the beach program is provided by the United States Environmental Protection Agency (USEPA). These funds support primary beach program activities which include: sanitary surveys, development and implementation of a risk-based monitoring plan, and bacteriological testing at marine beaches. Currently, the USEPA does not provide funds to monitor freshwater bathing beaches. Freshwater beach managers are responsible for sampling and following HEALTH approved regulations. From May through September 2009, approximately 1,770 samples were collected from all 68 monitored saltwater bathing beaches. All samples were analyzed for Enterococci as required in the Federal Beaches Environmental Assessment and Coastal Health (BEACH) Act. JSI, 2010.